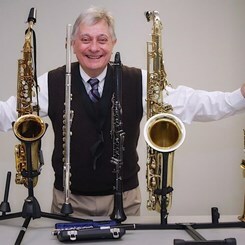 Bruce Coates, is a saxophone, clarinet, and flute teacher. He has over 25 years of teaching experience while doing his student teaching at Howard Community College. Bruce attended college at Towson State University and studied with many great teachers, including Hank Levy. Bruce performs regularly with saxophone chamber music ensembes as well as playing jazz. As an educator, Bruce has helped many students audition into Junior and Senior All State Bands in Maryland and Pennsylvania, as well as preparing students for success in solo and ensemble performances. Many of the students selected were ranked very highly in the state. He has helped his students pursue music into their college careers and they have recieved scholarships from many prestigious colleges such as, the Eastman School of Music, the Peabody Conservatory, the University of Maryland, and many more. Request Lessons with Bruce today!